Early school-age English children acquire over 3000 words a year. The main factors which account for such rapid vocabulary growth are context and word-formation knowledge. Such vocabulary growth is also of great interest in the L2 acquisition. 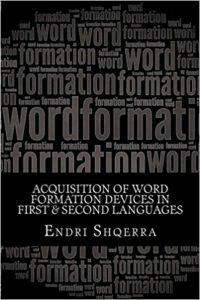 Using empirical tests, the book puts side by side L1 and L2 acquisition of word-formation devices. The first chapter explores the early acquisition of word-formation devices by English children and presents the principles through which cross-linguistic influence diverts L2 learners from the natural way of acquiring word-formation devices of their target language. It also presents the ‘Dual Semantic Transparency’ Hypothesis in the L2 acquisition. The second and third chapters utilize empirical evidence in examining the advanced acquisition of word-formation devices by both native speakers and L2 learners, as well as highlight the points in which morphological cross-linguistic transfer is more evident to L2 learners. The fourth chapter offers suggestions over the way L2 learners’ knowledge of word-formation devices of their target language can be improved. The book is targeted to anyone interested in language acquisition. As an English professor, I had previously published a book in which I contrasted word formation processes of English and Albanian languages. Then, my publisher "LAP LAMBERT Academic Publishing' asked me for a book related to the topic of an essay I had published. Here began my work with this book. Morphemes’ order stipulated by Extended Level Ordering, as we shall also demonstrate in this book, corresponds with the order word-formation morphemes rules are acquired by English children… How are word-formation devices acquired in the second language acquisition?… Mochizuki and Aizawa (2000) tried to establish affixes’ acquisition order to Japan speaking English learners… Danilovic et. al., (2013) tested the order established by Mochizuki and Aizawa (2000). Testing Serbian speaking English learners, the authors conclude that the “order differed for Japanese and Serbian learners” (Danilovic. J. et. al., 2013).